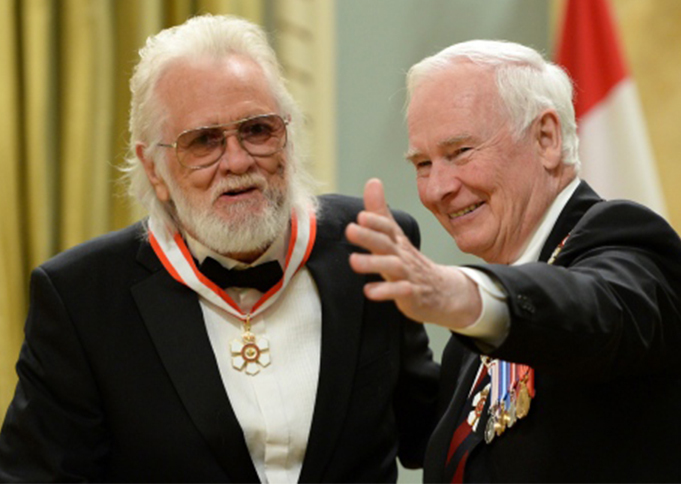 Congratulations Ronnie Hawkins on being awarded the Order of Canada. The Order of Canada (French: Ordre du Canada) is a Canadian national order, admission into which is, within the system of orders, decorations, and medals of Canada, the second highest honour for merit. It comes second only to membership in the Order of Merit, which is within the personal gift of Canada's monarch. To coincide with the centennial of Canadian Confederation, the three-tiered order was established in 1967 as a fellowship that recognizes the achievement of outstanding merit or distinguished service by Canadians who made a major difference to Canada through lifelong contributions in every field of endeavour, as well as the efforts made by non-Canadians who have made the world better by their actions. Membership is thus accorded to those who exemplify the order's Latin motto, desiderantes meliorem patriam, meaning "they desire a better country", a phrase taken from Hebrews 11:16. The three tiers of the order are Companion, Officer, and Member; specific individuals may be given extraordinary and deserving non-Canadians granted with honorary appointment into each grade. The order is administered by the Governor General-in-Council on behalf of the Queen of Canada. The monarch, at present Elizabeth II, is Sovereign of the order and the serving governor general, currently David Lloyd Johnston, is its Chancellor and Principal Companion. Appointees to the order are recommended by an advisory board and formally inducted by the governor general or the sovereign. As of February 2011, 5,837 people have been appointed to the Order of Canada, including scientists, musicians, politicians, artists, athletes, business people, television and film stars, benefactors, and others. Some have later resigned or have been removed from the order, while other appointments have been controversial. Appointees receive badges and the right to armorial bearings.